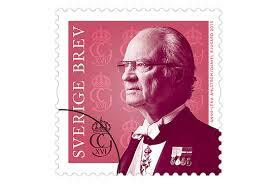 Individual portraits for the 5-year edition of the main Swedish stamp. The successors to the throne, H.R.H. Crown Princess Victoria and H.R.H. Princess Estelle, with the King and the Queen, on the jubilee stamps. Photo shoot on a sunny day in Östra Valvet in the Royal Castle in Stockholm.